Rodney Strong is a striking and dramatic winery. Upon arrival you might quickly draw the conclusion that this is one of those wineries owned by a giant corporation charging $20 per tasting and drawing throngs of wine lovers to its tasting room. But it’s not; in fact Rodney Strong is family owned and proud of it. The winery makes great wine but a visit there provides so much more. During the summer time, the winery sponsors concerts in its outdoor amphitheater and wine and food pairings on the terrace. It was the latter that brought us back to Rodney Strong for another exceptional wine tasting experience. On this particular trip to Sonoma, we were seeking “exceptional” wine tasting experiences. We first got the idea when we visited Rodney Strong last fall. By exceptional, I mean we are seeking either a beautiful setting, or a leisurely seated wine tasting experience, or a gourmet food and wine pairing, or an otherwise unique and special wine tasting experience. For $55.00 per person, the winery offers a leisurely paced food pairing of small, gourmet bites with five different wines. Seated at an umbrella shaded table overlooking the expansive picnic grounds and vineyards, we were offered an envelope with cards describing the menu of soon-to-come food delights and winemakers notes for each of the wines. The food was prepared by Chef Tara Wachtel and served by Greg, a long-time employee, former home winemaker, jazz pianist, and general expert of our favorite drink, wine. Rodney Strong did not disappoint. Nearly two hours, six courses, and five wines later (plus a few extra tastings), we were feeling thoroughly relaxed and very satisfied. 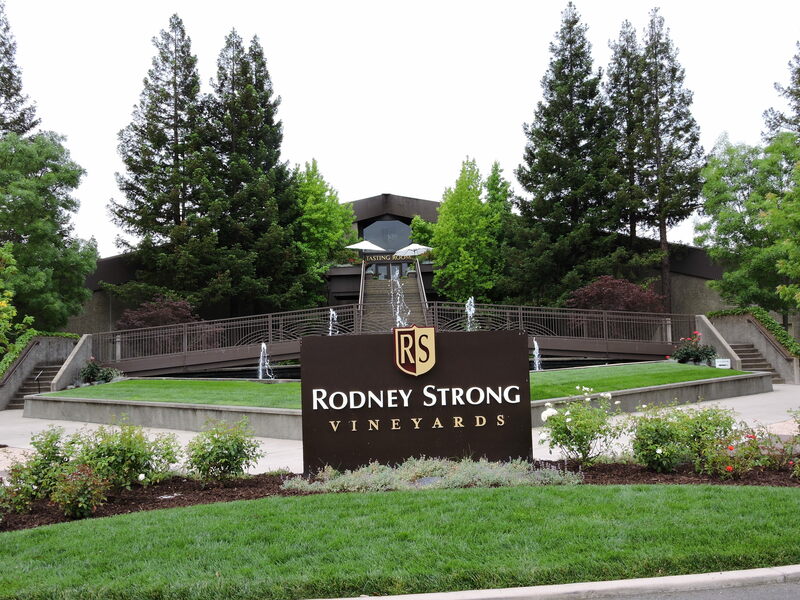 We walked away with a greater knowledge and appreciation for the wines that are produced in Sonoma County and thoroughly impressed with the Rodney Strong staff that made us feel like special friends just visiting for lunch. Call ahead and reserve a time for your own exceptional wine tasting experience. You’ll find it hard to go back to the old process of standing in a crowded wine tasting room, elbowing your way to the wine counter. Next stop on the tour was Sbragia Winery, north of Healdsburg on Dry Creek Road. We visited this place last October and had an exceptional wine tasting experience then. The view is beautiful, too, so we decided to add this to our list of wineries to visit on this trip in search of unique wine experiences. Sbragia offers a variety of different options including tasting on the terrace with a charcuterie and cheese plate for $30, a chocolate and wine pairing for $30 per person or $15 for wine club members, or a sensory tasting for $50 per person or $20 for wine club members. 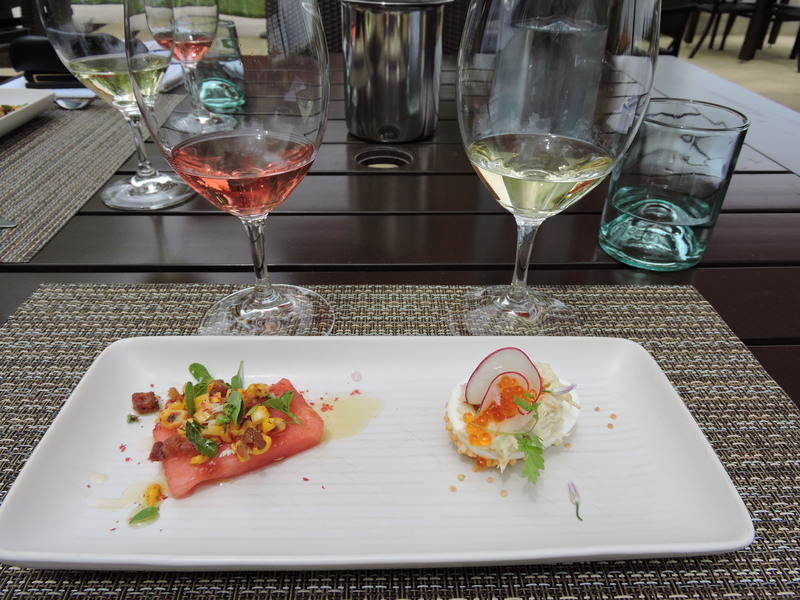 The winery will also conduct customized tastings such as a compare and contrast of one varietal (a chardonnay to chardonnay or vintage to vintage), with advanced notice. We called ahead and signed up for the sensory tasting. Wow! What an experience! Arriving early, we got a lot of good photos from the spacious deck overlooking Dry Creek Valley while we waited for our tasting to begin. Our host was Andrew McPherson. A wine collector for 20 years now working in the wine industry, this man was a wealth of knowledge. Andrew reserved the library for this special tasting, and supplied us with a generous and sumptuous charcuterie board. 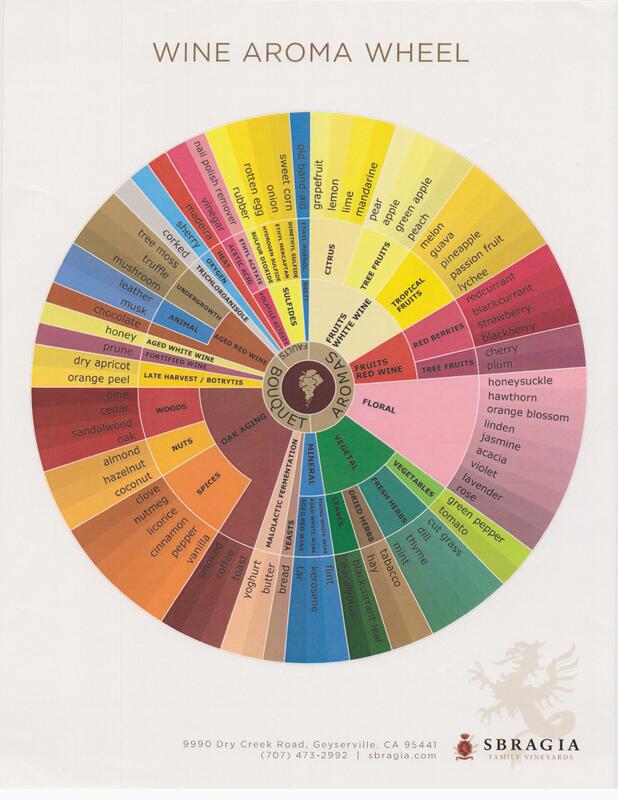 The sensory tasting is almost a sommelier like experience where visitors get to learn what aromatics are using the La Nez Du Vin wine aroma kit, along with tasting five different Sbragia wines. The kit contains 54 little jars of different aromas. We used ten, two per tasting, for this exercise. We started with a sauvignon blanc, then a chardonnay, before working our way into the reds. The way the sensory tasting works is you start smelling and tasting the wine to try and detect the different characteristics. Then Andrew would hand us two different vials and ask us to guess what the smells were from. He also supplied us with a wine aroma wheel that separates the fruits in white wine to fruits in red wine, floral scents and flavors, vegetal, oak aging characterics and even off odors that sometimes show up in a bad wine or a wine with a bad cork. Each time we tasted, sniffed, and wrote down our guesses. Then Andrew would tell us what the actual scent was and let us smell the vial again. It was pretty laughable how many times we got it wrong but the experience was an important step for us in helping develop our palates. After two and a half hours and a sampling of some of Sbragia’s other reserve wines, we were done! Thankfully, this was the only appointment we scheduled for the day. Because there were only the two of us with Andrew, we really got a crash course on wine tasting. But, I would definitely go back again with friends and do it all over again. For those of you looking to teach yourself at home, you can actually buy the kit for $399 at winearomas.com. This is often a required kit for enology students at UC Davis. You know how students sell their text books back at the end of the semester to get some money back? I think I’ll head over to the UC Davis book store and see if I can’t pick up a used aroma kit sold back by a recent, broke graduate. Who knows? Maybe next time I’ll get more than two out of ten right! Next stop on our trip was La Crema wine tasting room in downtown Healdsburg. This is a spacious and well appointed tasting room. You’ve read my blogs about the various La Crema chardonnays so you already know that I’m partial to them. But visiting the wine tasting room is always a treat, especially if you are a wine club member. The very first time that Gary and I visited La Crema in October 2015, I was duly impressed with the royal treatment. 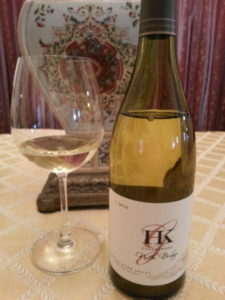 Upon arrival, Gary mentioned that I write a chardonnay blog and was looking for the perfect chardonnay. Lisa, the wine tasting room lead, quickly took over and lined up a side by side tasting of every chardonnay they had open that day. My favorites were the 2012 Nine Barrel, the 2013 Russian River Valley, and the 2012 Arroyo Seco chardonnays. We joined the wine club that day and went home with too many bottles to count! The next time we returned in March of this year, as wine club members, we were escorted to the members only lounge in the back of the tasting room, and invited to sit down in the comfortable living room style seating. The convivial Shelby served us several of their premium wines, while expertly describing the origin of each one. And on this trip, we were lucky enough to meet up with Lisa again. Well, actually, I called the winery ahead of time and made an appointment for a special tasting of the 9 Barrel Wines, La Crema’s top of the line series of wines, and thankfully Lisa took the call. I’m now the editor of the Sacramento Lifestyle Magazine, so I was on a mission to write an article on exceptional wineries and wine tasting experiences. But my “secret mission” was to taste the best of La Crema’s chardonnays again. Upon arrival, Lisa hugged us both and led us back to the special “9 Barrel Library Room.” I have to admit, I’ve never been greeted in such a friendly manner by a wine server before. But, what the heck, this is part of the experience. La Crema staff take great pride in not only being knowledgeable about their wine, but by being super hospitable as well. They are all eager to ensure that their guests have an excellent experience. La Crema is now in the process of building a beautiful new wine tasting room in the heart of the Russian River Valley, a short distance from Healdsburg. When I know more, I’ll share the news on my blog. I can’t wait until opening day! I promised to blog on our trip through the Sonoma County wine region and what a trip it has been so far! We are always searching for the perfect chardonnay, but on this trip we are also gathering material for an article on exceptional wineries and wine tasting experiences. We started our day with a return to Chalk Hill Winery, just outside of Windsor, in a beautiful hilltop setting. 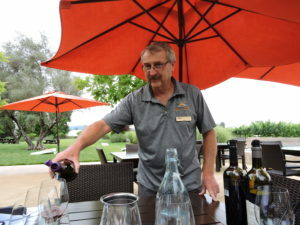 The lovely Hannah provided us with two tastings on the patio overlooking the pond and grape fields below, then drove us around the property for a tour of the pavilion, horse stables, owner’s house, and of course, many of the grape fields. We returned to the bucolic and shaded patio for our final two tastings. Hannah invited us to join them for their “White Party” up at the pavilion on Saturday. I love a party and I love this winery so it was pretty tempting to say “yes” but we have a pretty busy schedule already that day. I do love the Chalk Hill Estate chardonnay, so we couldn’t leave without purchasing at least one bottle. For a picnic, we hopped across Chalk Hill Road to Chalk Hill Winery’s sister winery, Roth. This is a new facility, only about two years old, with lots of comfortable seating on their patio in the front of the winery. Amanda served us from their tasting menu while we dined on our lunch. Roth also has food for sale if you prefer. It is a “deconstructed sandwich” in a picnic basket. You choose the meat and cheese, and they include the veggies and bread for you to put together your lunch. We didn’t have time to visit their wine cave, but will make sure to stop by again when we return to Chalk Hill. One more note about Roth: their wine prices were half the cost of what we normally see in Sonoma, so they get extra points for that! This is HKG’s Sonoma County estate grown chardonnay and a good example of barrel fermented and Sur Lie aged wine. This chardonnay is fermented in French oak barrels, and a secondary fermentation also takes place in the barrel. The result is a lot of oak in the nose and the flavor. The wine is a solid gold color, lots of legs in the glass. It’s complex, smooth, medium bodied and well structured. The mouthfeel is creamy and I like that, but oak dominates the flavor and I’m not a big fan of that. After tasting this one, I think I prefer less oak and more of the vanilla, butterscotch flavors you often see in the Russian River. My husband and tasting partner, Gary, however, loved the big oak in this chardonnay. 14.7% alcohol. We purchased this at the winery and although I’m not crazy about their chardonnay, I do think the winery is beautiful and worth a visit.